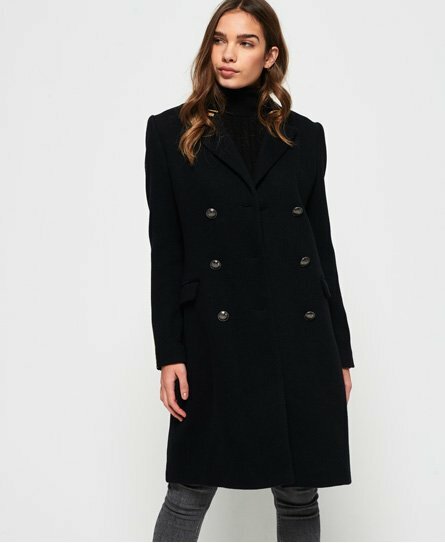 Superdry women’s Duchess long wool coat. This stylish coat instantly uplifts everyday ensembles with its chic and sophisticated design. This timeless wool coat features a front button fastening, two external and one internal pockets and delicate embroidery on the collar and sleeve to add texture. The detail in this coat is second to none, with premium branded button cuffs and back strap to create a flattering fit. To complete, this jacket has a Superdry badge on the sleeve for the finishing touch. Complete the look with a shirt tucked into jeans and finished with boots for a smart casual outfit.